Upon installation of a refilled HP 952, 952XL or 956XL ink cartridge you will observe various ‘Used’, ‘Counterfeit’ & ‘Non-HP’ alert messages. Choose ‘Yes’, ‘Continue’ and/or ‘OK’ to bypass the various nuisance alerts. This will enable normal print operations. 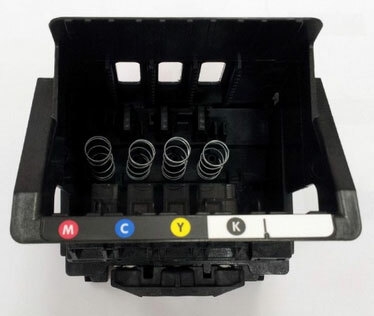 With refilled ink cartridges, if you received an “Unauthorized ink”, “non-genuine ink cartridge may affect warranty”, “counterfeit ink” or similar message, you can simply ignore/dismiss these messages by pressing ‘OK’ once for each cartridge, so that the printer resumes its normal operation. If you do not have the full printer driver version installed it is possible that you may not be able to see the cartridge error bypass option – you may need to install the complete printer driver version for your computer’s operating system. 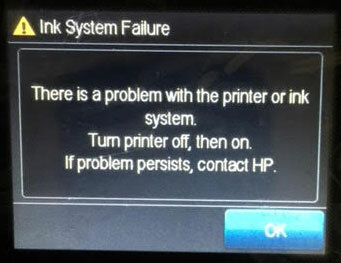 1) For the HP printer error(s): “Printhead Failure“, “There is a problem with the ink system” or “Ink System Failure“, we suggest you return to ink refill lab and request to have the cartridge’s chip evaluated and request to have the ink cartridge weighed to ensure it has an adequate amount of ink inside (i.e. if air is ingested into the internal PRINTHEAD this will usually cause a ‘Printhead Failure’ error condition, or similar). 2) For the HP printer error “Problem with Printhead” or “Depleted Ink Cartridges“, then one (or more) of the refilled ink cartridges is likely empty and will need to be checked for proper ink fill volume/weight. Return cartridge(s) to your ink refill lab for evaluation. – Retest printer using plain paper or a different paper type (standard bond is suggested). – Replace cartridge if suspected to be physically damaged. 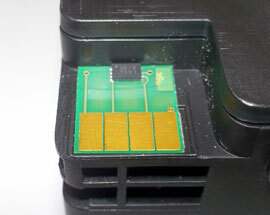 – If smart chip position looks incorrect, return ink cartridge to your refiller for evaluation and/or chip replacement. Press ‘Return’ button (lower left side) four (4) times until ‘Support’ menu is displayed. At ‘Support’ Menu, using the arrow key, navigate to the ‘Service Menu’, press Ok.
Use arrow keys to advance to the ‘Special Reports’ Menu. Select OK.
Use arrow keys to advance to the ‘print mech button tap’ menu. Select Ok.
‘code = 0’ will be displayed. Use arrows keys to change value to ‘41’ (i.e. press and hold right arrow key). When ‘Code = 41’, select ‘OK’. The diagnostic test pattern will print. Press ‘ok’ to activate either of the 3 selections above. 5) Remove all 4 ink cartridges, then remove the internal PRINTHEAD and thoroughly clean rear electrical contacts and carriage electrical contacts. Inspect ink foam ports to see if they are ‘wet with ink’…this will confirm whether ink is being pulled into the PRINTHEAD or not. If the ink foam ports are completely dry (no significant amount of ink present when blotted with a paper towel, etc. ), then the PRINTHEAD is likely considered too dry to support proper ink flow and subsequent printing operations. Refer to PRINTHEAD removal process at HP.com (see link above). 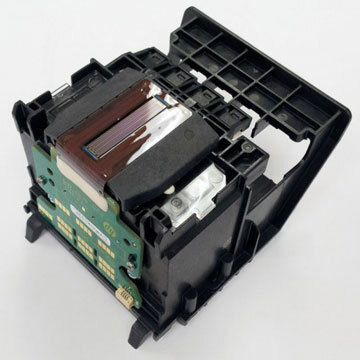 Remove the PRINTHEAD – for most printer models you will need to pull up on the lever adjacent to carriage assembly to unlock the printhead (NOTE: printhead cannot be easily removed on 8100 series printer models as partial printer dis-assembly is required). Lift printhead straight up to remove. Over a sink, run warm tap water directly into the 4 ink ports for approximately 2 minutes – this will effectively saturate the foam ports and blow ink out/thru the nozzle plate bottom. Using a lint-free towel, remove water from rear/bottom electrical contacts. Ensure printhead electrical contacts and exposed surfaces are fully dry. Install the printhead into the printer. 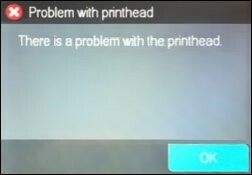 You may observe a “Replace Printhead message” so you will need to cycle printer power by turning printer off and then on to clear the error. Install ink cartridges and retest printer. You should observe a New PRINTHEAD alert message followed by an approx. 4-minute preparation countdown prompt. If permissible, activate the ‘Clean Printhead’. This can be done from the printer’s control panel or software printer driver (for example, by selecting ‘Tools’ – ‘Clean Printhead’, or similar). If you have reached this point of the troubleshooting and all the previous troubleshooting steps did not work, then the printhead is likely damaged or at end of life* and may need to be replaced. NOTE: If you are unable to remove the PRINTHEAD assembly then consult your User’s Guide for specific instructions or refer to HP.com. However, if you observe missing colors or poor image quality then air may have been accidentally ingested into the ink lines between the cartridge(s) and PRINTHEAD. 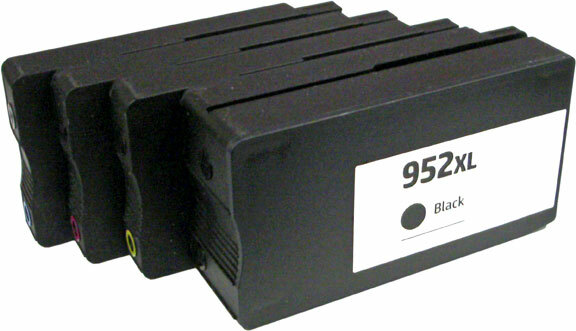 To recover from this problem, you will have to run the “Clean Printhead” procedure 2-3 times to recover the ink system. Watch the video on the HP support page which describes some of the common issues you may encounter with refilled ink cartridges. This type of problem is common and completely recoverable. **Typically the printhead should not reach it’s end-of-life until after a minimum of 8 or more complete sets of cartridge changes. While some printheads may last 20,000+ pages others may only last 4000 pages, actual results will vary. 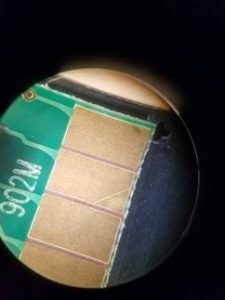 The printhead will eventually fail in time due to an internal micro-electronics failure, due to the following leading factors: general customer print usage and printer care, printer duty cycle (i.e. # pages printed per month), printing frequency (i.e. time between each print job), print mode (i.e. draft vs. normal) and content printed (i.e. photos vs plain pages) and color mode (black and white only vs. color/greyscale printing). Paper types used (i.e. plain paper, photo papers & matte/heavy bond papers) and paper edge curl (i.e. duration in printer and/or exposure to low relative humidity) can also quickly lead to premature printhead failures due to physical ‘head strikes’ of the paper edges making repeated contact with the printhead nozzle plate surfaces.